Personalize your family jewelry with this 3-stone personalized family gemstone cross swirl necklace in 14K white gold from Apples of Gold Jewelry. 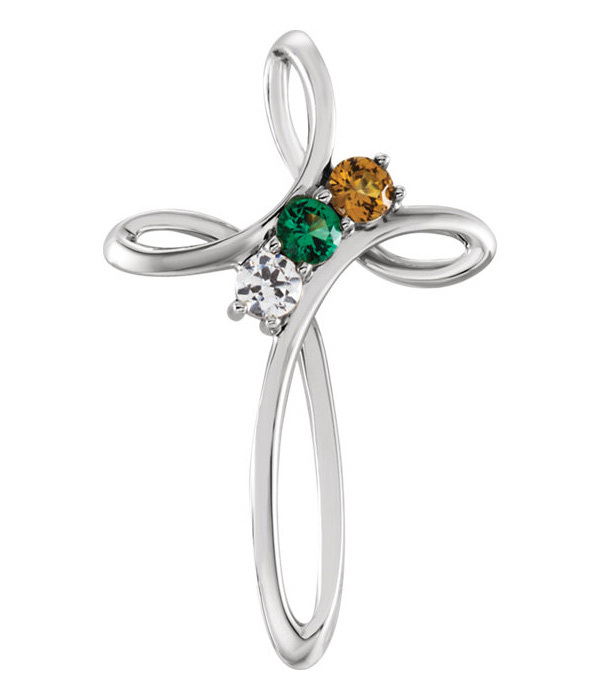 The beautiful cross pendant is made from 14K white gold and features looping arms thanks to the swirl design of the gold. The cross measures in at 1 3/16" tall by just under 13/16" wide, and weighs approximately 2.67 grams. The pendant is made personalized and special with your choice of three stones: gemstones or diamonds, or both. The gemstones are 3.5mm in size and "AA" rated for quality (or "A" rated for aquamarine, emerald, ruby, and sapphire gemstones), while the 0.15 carat diamonds are G-H for color and I1 for clarity. With an inside bale that measures 3.9mm in size, the pendant can accommodate chains up to this size. We guarantee our 3-Stone Personalized Family Gemstone Cross Swirl Necklace, 14K White Gold to be high quality, authentic jewelry, as described above.